Surface-mounted 32" x 7/8"Adjustable Door Bottom Seal, 320C-32 is an easy-to-install solution that effectively seals gaps between the bottom of your door and the floor. Specify the width of your door and we'll trim the Adjustable Door Bottom. Surface-mounted 36" Adjustable Door Bottom Seal, 17/32", 320C, is an easy-to-install solution that effectively seals gaps between the bottom of your door and the floor. Specify the width of your door and we'll trim the Adjustable Door Bottom. Surface-mounted 36" x 7/8"Adjustable Door Bottom Seal, 330C-36 is an easy-to-install solution that effectively seals gaps between the bottom of your door and the floor. Specify the width of your door and we'll trim the Adjustable Door Bottom. Surface-mounted 42" x 17/32"Adjustable Door Bottom Seal, 17/32", 320C-42 is an easy-to-install solution that effectively seals gaps between the bottom of your door and the floor. Specify the width of your door and we'll trim the Adjustable Door Bottom. Surface-mounted 42" x 7/8"Adjustable Door Bottom Seal, 330C-42 is an easy-to-install solution that effectively seals gaps between the bottom of your door and the floor. Specify the width of your door and we'll trim the Adjustable Door Bottom. Surface-mounted 48" x 17/32"Adjustable Door Bottom Seal, 17/32", 320C-48 is an easy-to-install solution that effectively seals gaps between the bottom of your door and the floor. Specify the width of your door and we'll trim the Adjustable Door Bottom. Surface-mounted 48" x 7/8"Adjustable Door Bottom Seal, 330C-48 is an easy-to-install solution that effectively seals gaps between the bottom of your door and the floor. Specify the width of your door and we'll trim the Adjustable Door Bottom. Door Frame Seals, Heavy Duty Kit 599C, 7/8" thick x 1-1/2" wide, is an easy-to-install solution that effectively seals perimeter of door against jamb. A gasket along edge of lightweight aluminum presses firmly to create airtight fit. Door Frame Seals, Standard Kit 33C, 1/2" thick x 1-1/2" wide, is an easy-to-install solution that effectively seals perimeter of door against jamb. A gasket along edge of lightweight aluminum presses firmly to create airtight fit. Double-Leaf Door Frame Seals, Standard Kit 33C, 1/2" thick x 1-1/2" wide, is an easy-to-install solution that effectively seals perimeter of door against jamb. A gasket along edge of lightweight aluminum presses firmly to create airtight fit. Door Frame Seals Kit 33C includes two 8' length sides and one 8' top. Door bottom shown in the photo is sold separately. We carry a wide selection of door seals for studios, conference rooms, home offices and any room in need of sound isolation. We also carry airtight door gasketing frames that cover both side jambs, head jamb and doorsill. This creates a soundproof barrier that will help prevent sound transmissions inside and out of your room. The door seal kits are made from a durable aluminum frame that’s both lightweight and effective at blocking sound. 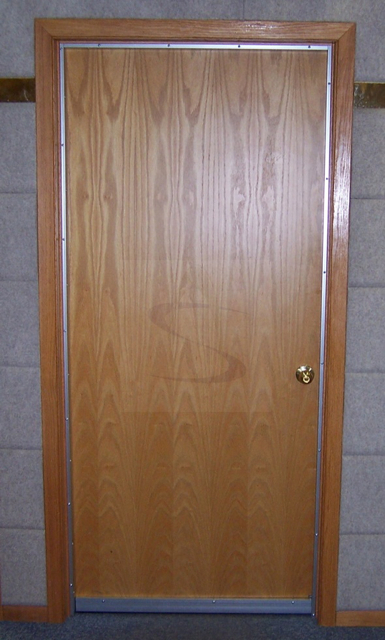 The kits and bottom door seals are perfect for wood and metal doors and come with everything you need for installation. From single doors to wide double-door frames, our kits deliver professional-grade sound isolation. Our versatile studio door seals are easy to install, fully adjustable and built to last. Shop around to find the best door seals for your home or office, or contact us for expert help finding exactly what you need before you buy.